Our 2018 Road Trip, Part 27: The Princeton President(s) « Midlife Crisis Crossover! The view on our way into New Jersey from West Point. DAY FIVE: Wednesday, July 11th. 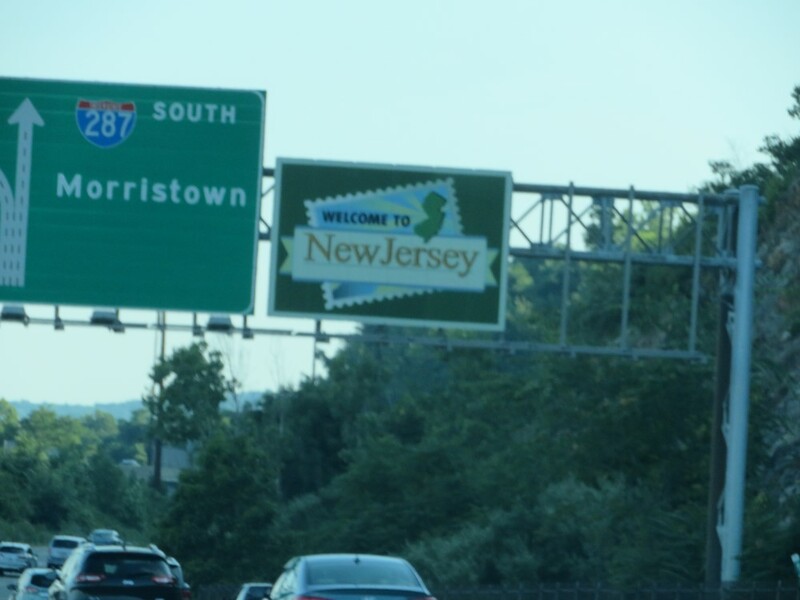 Parsippany surrounded us with forests, highways, and nothing else. We opted out of early wandering and settled for breakfast at the hotel buffet. Mostly harmless. We presumed we’d eat better later in the day. Our first stop was an hour away in a little town call Princeton. You may remember them from such works as A Beautiful Mind and TV’s House. Obviously they’re best known for Princeton University, one of those grand learning institutions with high standards, higher reputation, and highest tuitions. 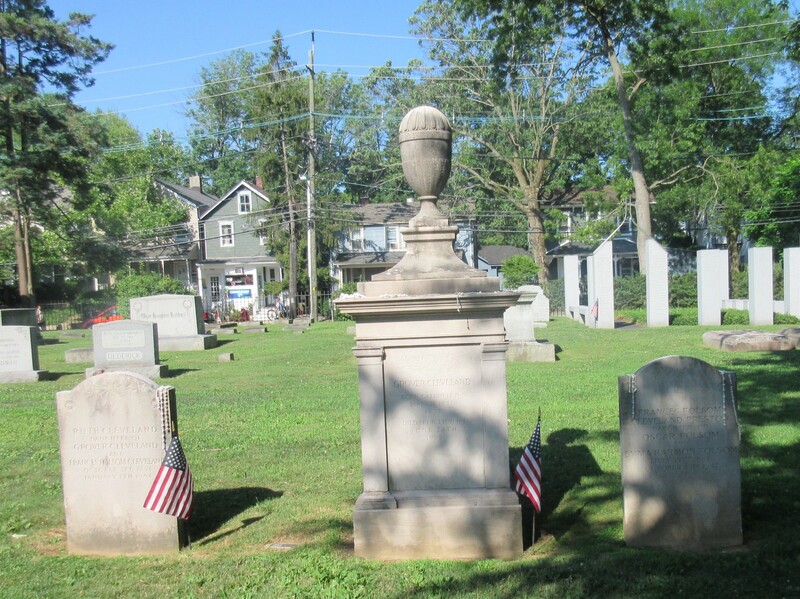 We had no plans to invade their campus, but a nearby residential neighborhood is the setting for Princeton Cemetery. 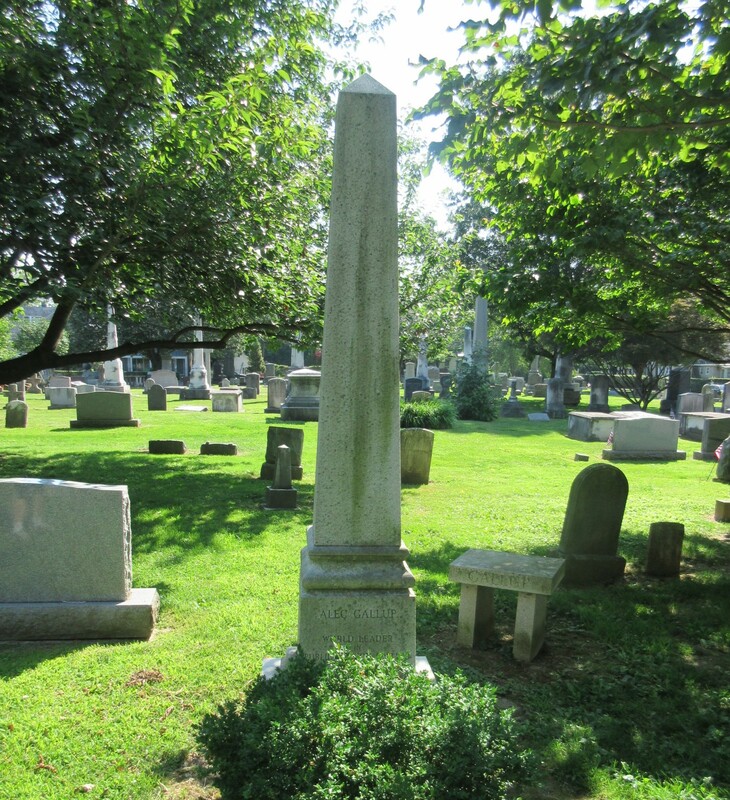 Established in 1757 and still in active use today, it has a dedicated section for the graves of several Princeton U presidents from throughout its storied history. For example: their third president was Jonathan Edwards, Puritan preacher and theologian. When Anne and I were in high school, his sermon-turned-essay “Sinners in the Hands of an Angry God” was part of the English class curriculum whether students liked it or not — not to tell them Hell is real, but as an example of a particular kind of persuasive writing from another era. It wasn’t my favorite at the time, but you don’t easily forget a title like that. 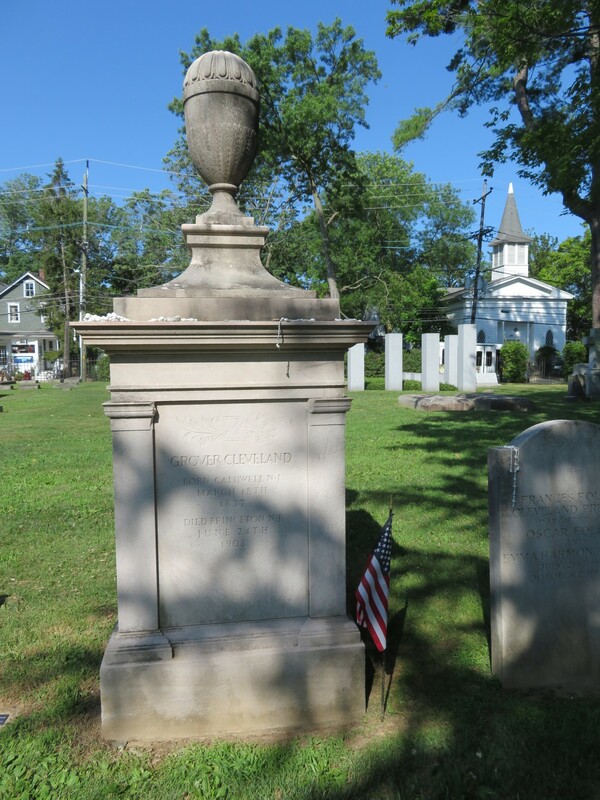 Not far from Edwards is Princeton’s sixth president, John Witherspoon, a minister who would become one of two delegates to sign the Declaration of Independence on behalf of the state of New Jersey, thereby making him an official Founding Father. He’s also an ancestor of Academy Award Winner Reese Witherspoon, believe it or not. In the film version of the Broadway musical 1776, Witherspoon was played by James Noble, best known as the governor from the sitcom Benson. 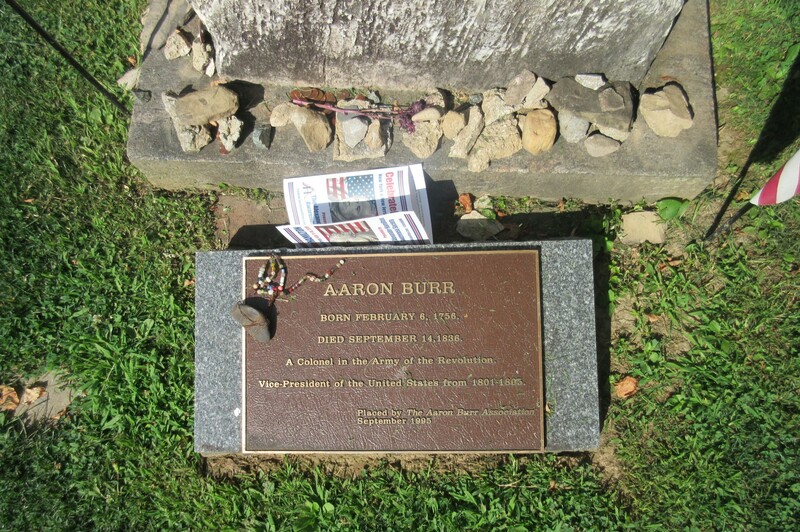 You may be more familiar with the name on another tomb in the cemetery: Aaron Burr, the third Vice President of the United States of America and the man who shot Alexander Hamilton in that infamous duel which didn’t seem suited to a musical at the time, and yet here we are. He was never a Princeton president, but his father Aaron Burr, Senior (yet another minister), was its second president. Both Burrs are buried here. In our past travels we’ve also visited the place where he shot Hamilton and his opponent’s grave in Manhattan. A not-so-great shot of Aaron Sr. and his tributary rocks. A few rows over is the family of one George Gallup, a pioneer in the field of public opinion polls and a trendsetter in the art of trying to predict election results long before Election Day. If you paid attention to a poll within the past month and either agreed with or seethed at the results, you have Gallup to thank. 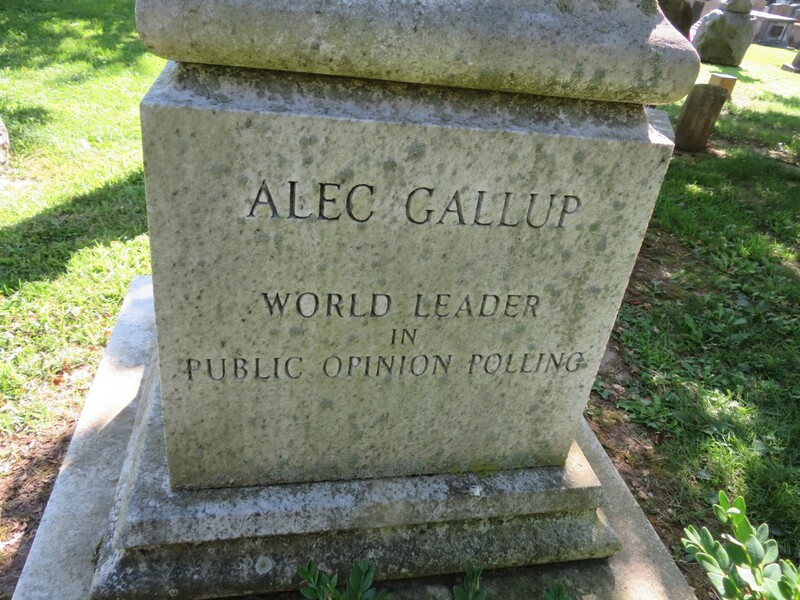 Unfortunately I screwed up, missed his grave and instead found that of one of his sons, Alec, who later helped run the Gallup Organization along with his brother George, Jr.
His contributions to the world of American polling were sufficient to earn him an obelisk. Remember: if you paid too close attention to informal polls before a disappointing Election Day, thank the Gallups for making them so thorough if not necessarily perfect. Then there was our primary objective: not a university president, not a Vice President, not the president of the company that correctly predicted some Presidential elections but gave Thomas Dewey too much credit. 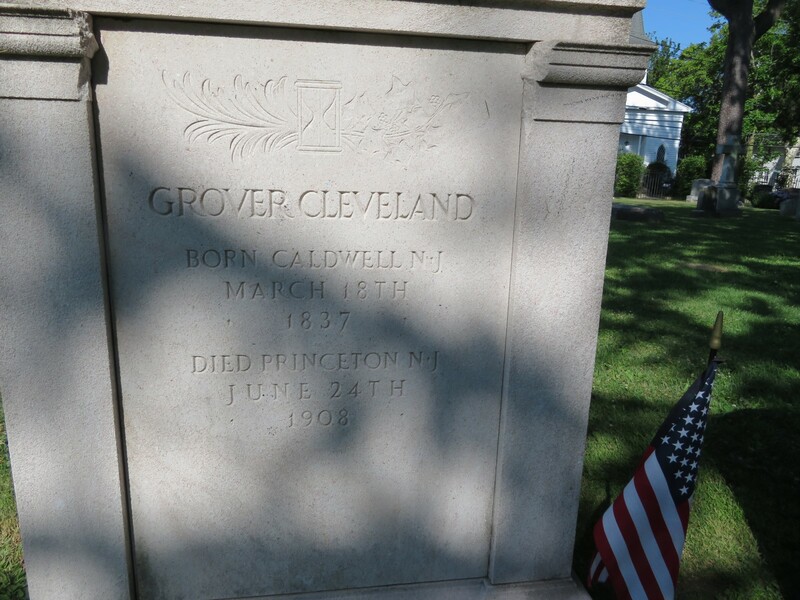 We were in Princeton to view the gravesite of an actual capital-P President: hometown legend Grover Cleveland. President #22 and #24: Stephen Grover Cleveland, d. 6/24/1908, age 71. Cleveland secured his permanent place in American trivia as the only President ever to serve two nonconsecutive terms. His plan to be an ordinary two-term President was foiled in the 1888 election when he won the popular vote but Indiana’s own Benjamin Harrison won the Electoral College, a thing that has indeed happened more than once in history. Like Rocky Balboa going after Apollo Creed in Rocky 2, Cleveland staged a comeback in 1892 and took the win from Harrison — partly because one or more corrupt voting practices had been all but eliminated during Harrison’s term, and partly because Harrison did virtually no campaigning as his wife was on her deathbed. Advantage: Grover. 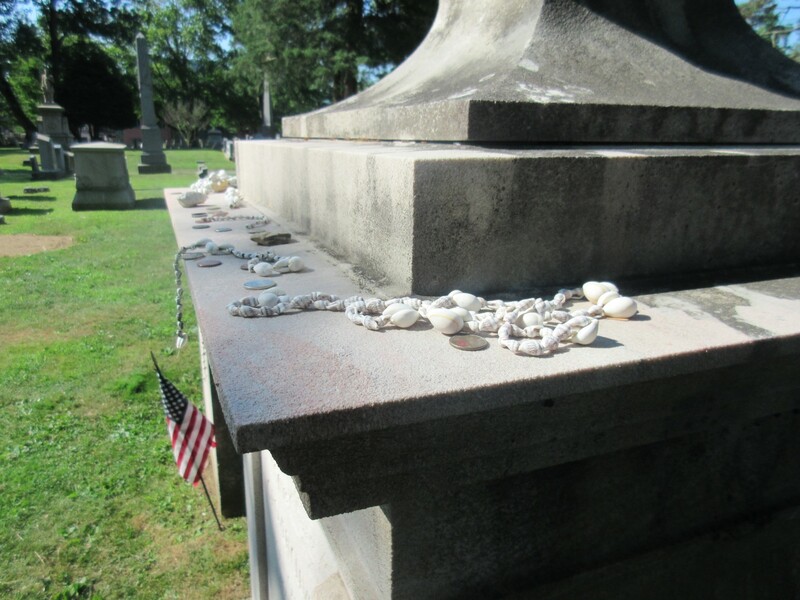 Money and jewelry left atop his stone by family or fan. Prior to the White House, Cleveland had served as mayor of Buffalo and governor of New York. The latter office also worked as a solid career launchpad for Martin Van Buren and both Roosevelts. His governing style was largely anti-corruption and had no use for political machines, but the Panic of 1893 led off a depression that dampened spirits throughout his second term. 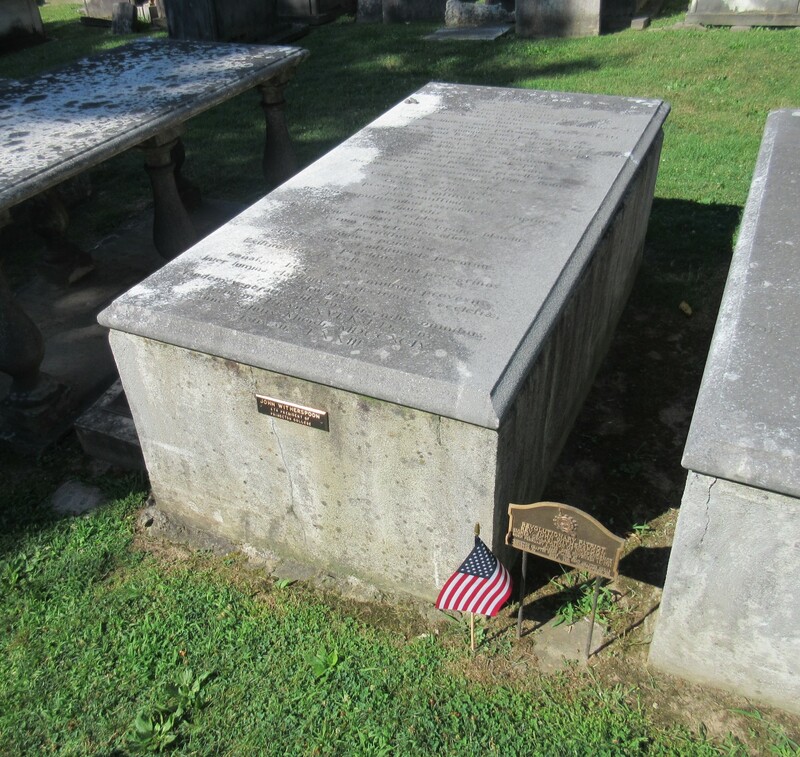 We previously saw the gravesite of his first Vice President, Indiana’s own Thomas Hendricks, at Crown Hill Cemetery. Hendricks died eight months after inauguration and left Cleveland without a VP for the remainder of his first term. 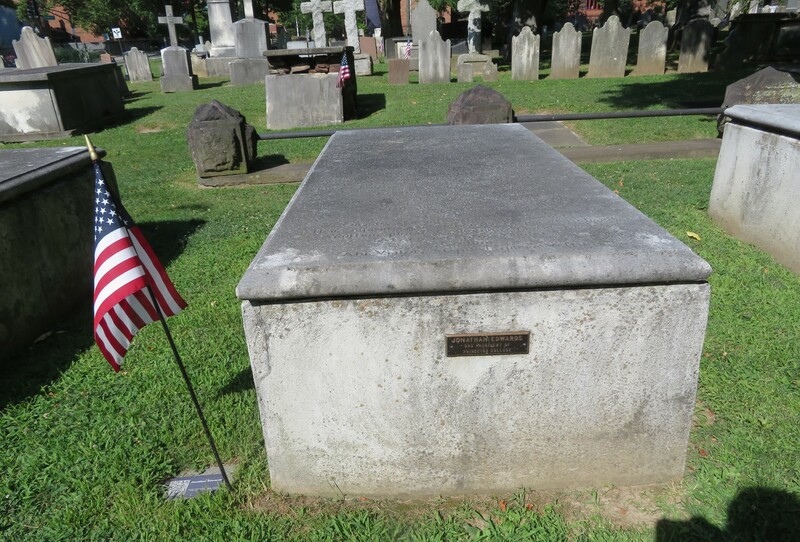 Hence his modest showing at Princeton Cemetery and no humongous cathedral in his name. 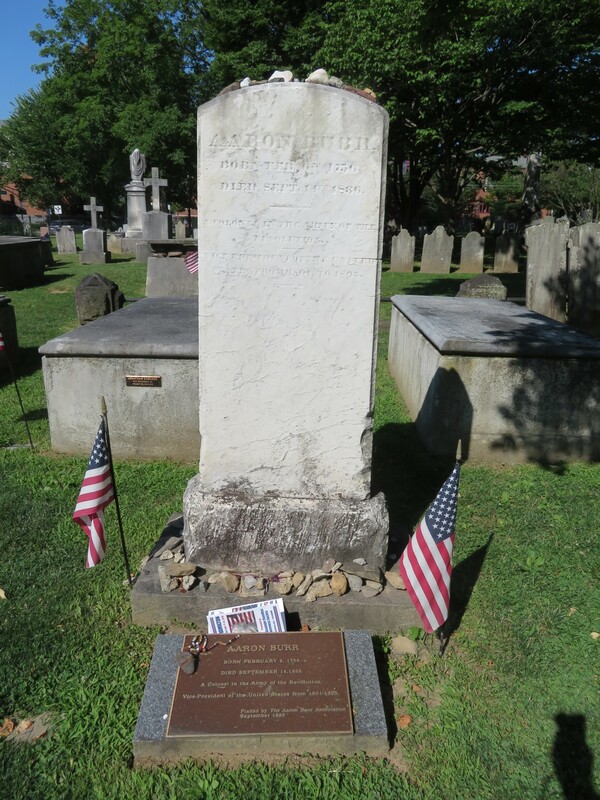 Buried on one side is his daughter Ruth, who died of diphtheria at age 12 and was allegedly the namesake of Baby Ruth candy bars, according to the company owner who really didn’t want to pay Babe Ruth royalties. On the other side was Cleveland’s wife Frances Folsom Cleveland Preston, who in 1885 at age 21 became the youngest First Lady ever. She passed away in 1947, outliving him by nearly four decades. She was a rare instance of a Presidential widow remarrying (her second husband was a professor at another university). The final whereabouts of Frances’ second husband, who passed away in 1955, are currently unknown. Also, unusual trivia: Frances was staunchly anti-suffrage. 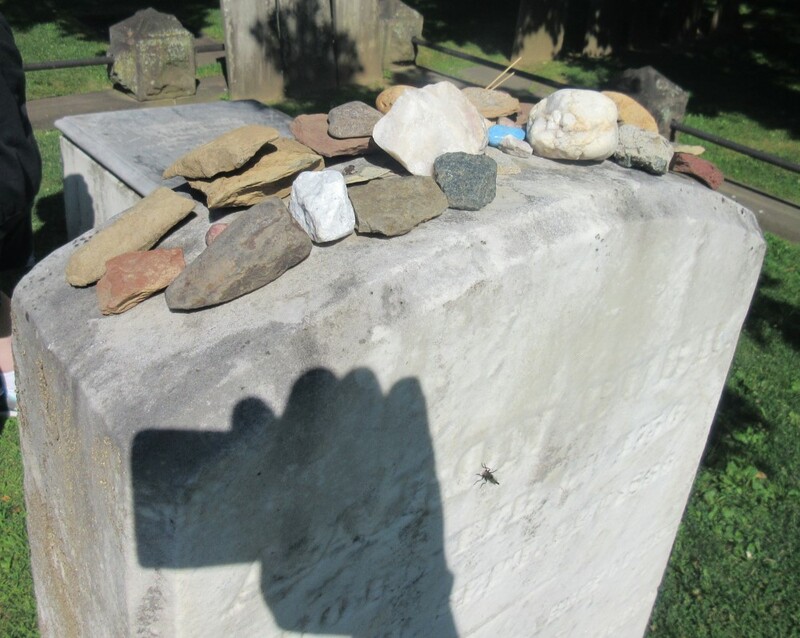 None of those headstones hold a candle to the most loving memorial we saw along our path. 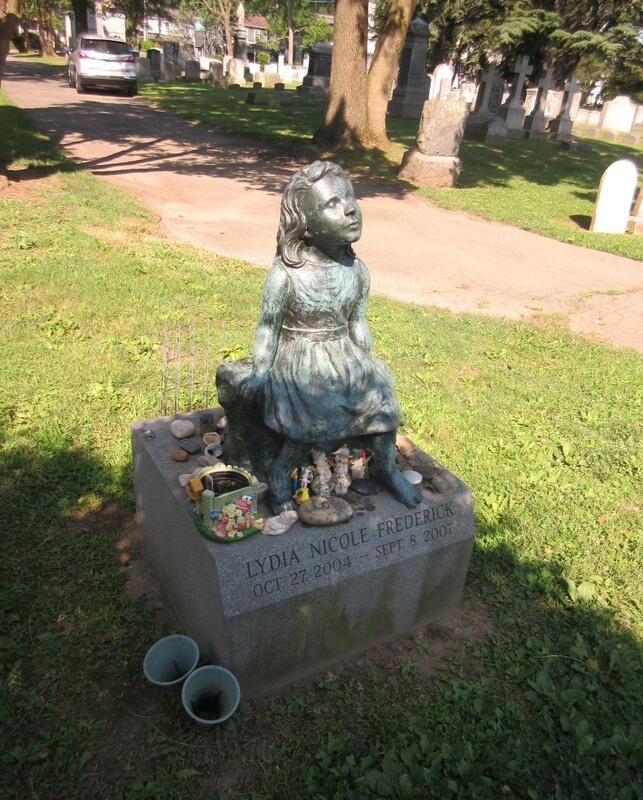 She isn’t famous, she died far too soon, and she was never president of Princeton in this timeline, but family love radiates like a beacon from where visitors still seek her today. Her story was told in brief online long ago, though the “Ugly Moose” link is now broken. « Vote! Vote! Vote! Vote! Vote! Vote! Vote! Vote!